There have been many attempts by Austria, trying to be successful in the Eurovision Song Contest, but only once in 1966 they managed to win with "Merci Cherie" sung and co-written by Udo Jürgens. Especially in recent years Austria tried to compete with songs sounding both fresh and international - but these songs had nothing typical Austrian and sounded like they could have been handed in by any other European country. There were great ballads like "Die Zeit ist einsam" ("And when the night comes") by Timna Brauer (Bergen 1986), hymns like "Kinder dieser Welt" ("Children of the world") by Gary Lux (Gothenburg 1985) or pop songs like "All to you" by The Rounder Girls (Stockholm 2000), that showed a great variety of different styles in Austria's Eurovision history. Thanks to Alf Poier who did well in 2003, this year Austria is allowed to participate directly in the big final on Saturday. 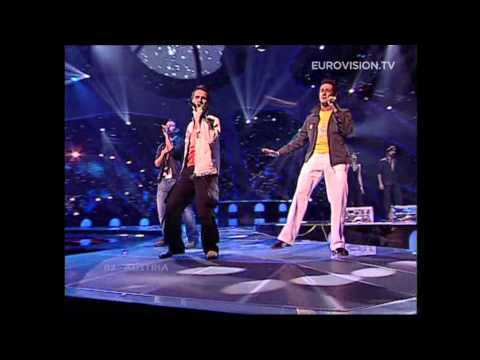 The Austrian public has chosen a group called "Tie-break" with the song "Du bist" ("You are"). "Tie-break" are Stefan di Bernardo, Thomas Elzenbaumer and Tommy Pegram - they won the Austrian preselection beating even Waterloo & Robinson, who already participated in the Eurovision for the country and became 5th in 1976 with "My little world". And quite rightfully they won as the voices of all 3 members are excellent and and the song is quite touching. So maybe the success of Austria will be carried on this year. It is still unclear whether the song will be sung in English or German. Good luck, Austria!